With lights and fun holiday accessories, your outdoor space can easily transform into a picturesque winter landscape straight out of a Christmas card! The holiday season is a perfect time to have fun decorating your outdoor space with twinkling lights, festive greens, and brightly colored poinsettias. With lights and fun holiday accessories, your outdoor space can easily transform into a picturesque winter landscape straight out of a Christmas card! 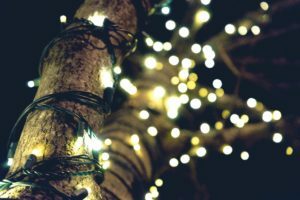 If you are searching for a little holiday inspiration, consider these four easy tips for decorating your outdoor space this holiday season! Lighted garlands are perfect for warming up the look of holiday lights in your outdoor space. Wrap a beautiful outdoor lighted garland around the railings of your deck for a warm, festive look for your lights. Because your deck is such a key feature of your outdoor space, this simple step for holiday decor will make your yard look especially festive this season. Icicle lights are a fun way to light up an outdoor feature such as your gazebo. Since these lights can seem a little overwhelming in larger spaces, your gazebo is the perfect place to use them this holiday season. Not only will these lights look beautiful as you look out your window in the evenings this holiday season, but they will also look beautiful from inside of your gazebo on a chilly winter night! Create a holiday wonderland in your outdoor space with colorful string lights wrapped around your pergola. With plenty of horizontal railings on this structure, you can create a fun, colorfully lighted pattern with red, white, and green alternating lights. Complete the look of lights in your outdoor space with creative holiday accessories all around. This is also the perfect way to add color to the look of your holiday lights. Consider adding beautiful red bows, lighted snowflakes, or outdoor inflatable holiday accessories for an especially fun look in your outdoor space this season!